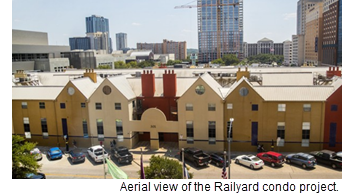 ​​​​​ AUSTIN – The Railyard Condominiums are for sale, a prime downtown site adjacent to the Austin Convention Center. The site could support up to 1.8 million sf of development and is not restricted by a Capitol view corridor. That means buildings higher than 50 stories may be expected. The site, which covers two half blocks at 201 E. Fourth St. and 301 E. Fourth St., could be remade into offices, apartments, condos, or a hotel. The 112-unit Railyard was completed in 1983 and is just about half of what it once was.